already wired for you, is that it still gives a great amount of light, but can be mounted flush, with no bulb shape showing. 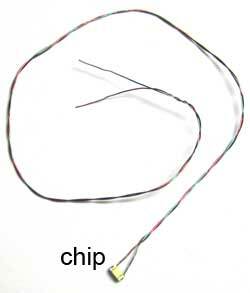 We have taken these SMD Chip LEDs and taking care with tolerances, added 14 inches of red and green superfine magnet wire. 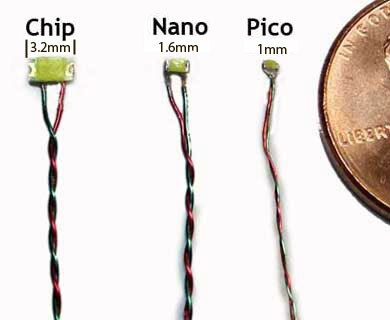 Get these chips already wired, tested, guaranteed, and fully ready to connect to your power supply. No resistors need to be added, we have done that part! "What do I need to run these?" How many can run at once? Using a 3 volt coin holder you can run 1-10 chips. 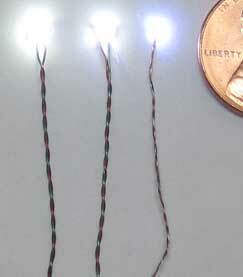 Using a 3 volt 1 Amp supply is also 50 chips, no need to turn off. The chips draw 20 milliamps each. So check your power supply to see how many milliamps it lists. A 1000 milliamp supply can run 50 chips. can the chip LEDs be run along with other LEDs from the same battery or coin cell? Yes the chips can be run right alongside all of the other sizes of LEDs on the same power supply. I need the AC type chips but I have to run them through a tight passage? 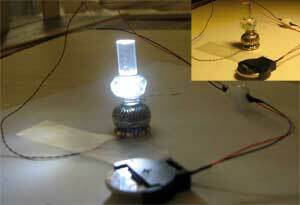 cool white Nano chip in a lamp!